The price of gold fell last month to $1,200. The lemming sentiment in capital markets is uniformly bearish, yet every price drop brings forth hungry buyers for physical gold from all over the world. Even hard-bitten gold bugs in the West are shaken and frightened to call a bottom, yet it is these conditions that accompany a selling climax. 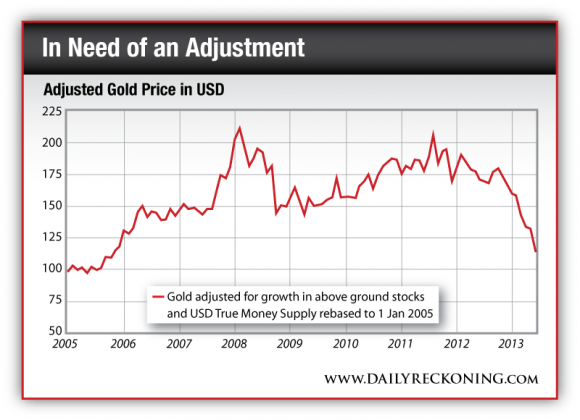 This article concludes there is a high possibility that gold will go sharply higher from here. There are three loose ends to consider: valuation, economics and market fundamentals. As far as I am aware, nearly everyone is overlooking the obvious. You cannot consider the value of gold without taking account of the changes in the quantities of the currency and the aboveground stock of gold over time. The chart above shows the adjusted U.S. dollar price of gold rebased to 100 in January 2005, when the gold price was $422. In 2005 dollars, using True Money Supply (TMS) plus excess reserves as the currency adjustment, gold has risen only 13.9%, to an equivalent price of $481. The TMS is a tool used by economists to measure cash, checking accounts and savings deposits that could be redeemed for gold under a full convertibility regime. 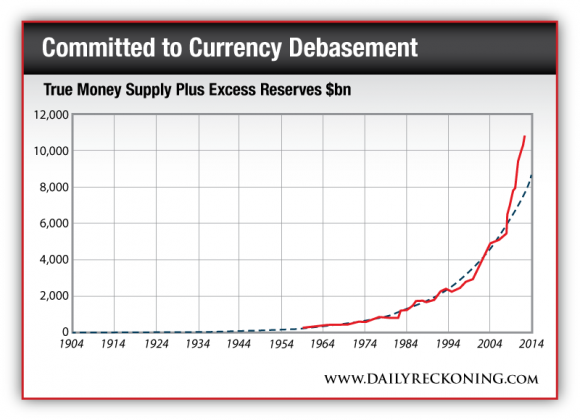 Excess reserves represent the funds deposited by banks at the Fed, which similarly can be redeemed for gold. In 2005, we were in the sunny uplands of growing economic confidence, when systemic risk appeared to have been banished forever. We had recovered from a destabilizing economic crisis the previous year, and both stock markets and house prices were rising. Today, eight years later, governments are committed to monetary inflation from which there is no practical escape, yet at $1,200, gold is only 9.6% higher today. The chart above is clear evidence that gold is mispriced to an exceptional degree, given the deterioration in fundamental monetary and economic conditions. The recent episode about tapering, when it dawned on the bigwigs at the Fed that their plan to save the world was not working and that they were caught like rats in a trap with no exit, exposed an important truth. When you rely, credit cycle after credit cycle, on debasing the currency to stimulate economic recovery, there comes a time when it fails to work completely, and instead you need to keep issuing new currency to avoid debt liquidation. The Fed has begun to realize this truth applies today and is trying to find a way out of their mistake. Meanwhile, prestigious economic and financial commentators, used to lapping up Fed policy statements, interpret the tapering episode as a “policy signal,” with which the Fed conditions the markets for monetary tightening. This optimistic view does not accord with a realistic assessment of economic prospects, the condition of the banking system and government financing requirements. It has become clear in the last few months that the U.S. economy is not recovering, and if a realistic deflator is applied, it is contracting in real terms. At the same time the largest economic area, the eurozone, is sinking into a deepening depression, Japan has resorted to printing yen just so the government can pay its bills. The U.K. is in a similarly precarious position as the U.S. The major economies have become hampered by too much debt, too much government and too much regulation. Their ability to recover and generate the tax revenues to rescue government finances and the profits to bail the banks out of their bad debts is, therefore, fatally impaired. It is this dawning realization that has become every central banker’s worst nightmare. Meanwhile, the global financial system was brought close to crisis by the mere whisper of higher interest rates, should the Fed try to reduce the pace of currency expansion. Markets were destabilized, and probably rescued only by exchange stability fund intervention. The issue of rising interest rates is particularly sensitive because there are in Europe undercapitalized banks that cannot afford the losses on government debt from even a modest rise in bond yields and are almost certain to collapse from the effect of unexpected interest rate increases on their interest rate swap exposure. Indeed, the parlous state of Europe’s banks was paraded before us only last week as the European Commission insensitively debated how to stick bondholders and depositors with the rescue costs. The governments of the U.S., Japan and the U.K. have now become accustomed to financing their deficits by expanding the quantity of currency and, in the case of the eurozone, the expansion of bank credit to finance government debt. The dynamics of this debt trap on governments are concealed by manipulated and self-serving statistics misleading the governments themselves with respect to the true state of affairs. The four major currencies are now irretrievably committed to monetary hyperinflation, and this is illustrated in the chart below, using the example of USD True Money Supply plus excess reserves. The dotted black line is the exponential rate of growth, which is the maximum rate at which TMS can grow without destabilizing the monetary system. Since the Lehman crisis, the rate of growth has become hyperinflationary. Another way to consider this issue is that to revert to a stable exponential rate, approximately $3 trillion would have to be withdrawn from circulation by the Fed. 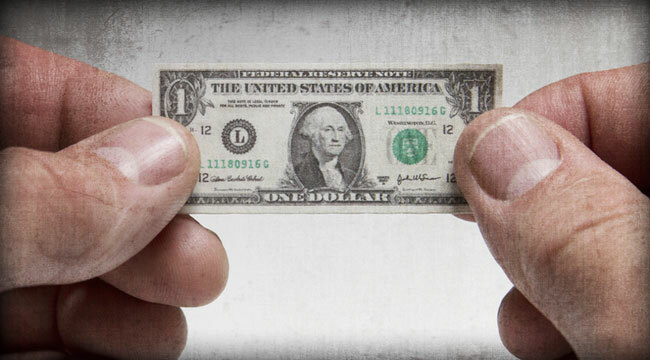 A monetary contraction on this scale is inconceivable, even if it is spread out over a number of years, not least because it would almost certainly collapse the whole monetary system. The world is now committed to monetary hyperinflation, yet gold at $1,200 today has risen by only $59 since 2005 in adjusted terms. Ed. Note: As fluctuations in the gold market frustrate uninformed investors, readers of The Daily Reckoning email edition are, conversely, well positioned to profit… no matter what the market throws at them. Each issue comes with a unique chance at specific investment opportunities you’re not likely to find anywhere else. Click here now to sign up for free. Alasdair Macleod runs FinanceAndEconomics.org, a website dedicated to sound money and demystifying finance and economics. Alasdair has a background as a stockbroker, banker and economist. He is Head of Research at GoldMoney.